Another week has gone by, but something has changed for the New York Yankees. That something happens to be their lead in the AL East. As the season is dwindling down, so is their lead. Last week they were up six games on their closest competitor. Today? They are holding a shaky 1.5 game lead over the surging Blue Jays. They have the capability to score runs…they just aren’t doing it. And that is what is holding them back. Yes, the Blue Jays are a formidable opponent, especially with their additions of Tulo and David Price to an already strong lineup. However, the Yankees certainly have the tools to beat them, as they have already this season. This time, it isn’t necessarily the pitching (three of the last five games have been decided by one run, with opponents scoring only two runs four times). Right now, it’s the silent bats that are causing them to sink in the standings. In the past five games, in which they are 1-4, the combined batting average for the squad was a dismal .161. Not only that, the Yankees left 32 runs on base during this span. They also were 0-18 with runners in scoring position. Now THAT right there is enough to make you angry as a Yankee fan. You can complain about Cashman and his lack of trade moves for a more reliable bat. You can complain about Stephen Drew’s lack of offensive productivity. But the truth is, right now they have no one to blame but themselves. We’ve seen the offense explode and know that they are capable of putting up a ten-spot in a game. It’s just a matter of seeing it now, when it really matters. Right now, the Yankees are looking ugly offensively. They are on another downswing, which we’ve come to expect by now. But now is not the time for that to be happening. 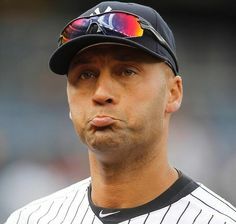 In the dog days of summer, we just have to hope the Yankees will get back on track. They have the talent to make it happen…it is just a matter of getting it done, right here, right now.